Here you’ll find videos highlighting Ashesi's students, alumni, programs and initiatives. On 4th March, 2002, Ashesi started its first class in a rented building in Labone. 17 years later, the University has grown to become one of the finest in Africa, with a pioneering model of education that is now a blueprint being adopted by others across the continent. TED Talk: How can education foster ethical citizens? At TED's "We The Future", Ashesi President Patrick Awuah shares a vision for African higher education. The prestigious WISE Prize for Education was presented to Patrick Awuah, founder and president of Ashesi. 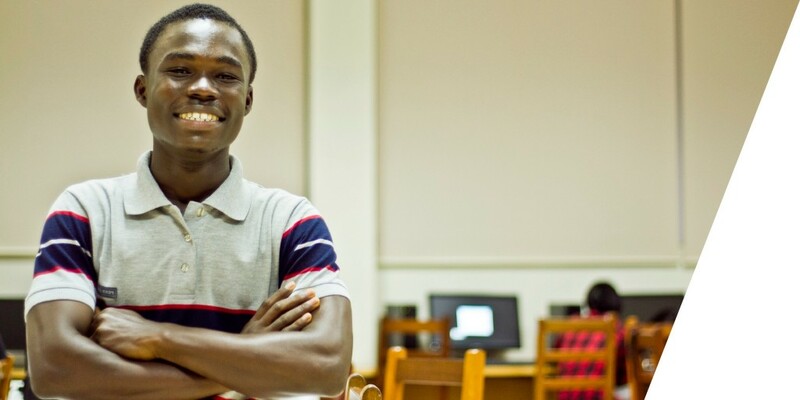 When Patrick Awuah - a former Microsoft executive who was educated in the U.S. -- returned to his home country of Ghana, his goal of starting a software company was dashed by the lack of a qualified workforce. So instead he founded Ashesi University, which is guided by principles of ethical leadership, innovation and entrepreneurship. Special correspondent Fred de Sam Lazaro reports. Funded through a grant from the World Bank Group and partners, the Ghana Climate Innovation Center (GCIC) is a green project incubation hub where entrepreneurs and startup ventures can access support to develop their innovative ideas into strong and viable businesses. This video shows a recap of the center's launch at Ashesi University, where it will be based. Ghana Bamboo Bikes Initiative is a fore-running social enterprise in bamboo industrialization for the creation of jobs and employment for the growing number of Ghanaian women and youth. learn how Global Bamboo makes smokeless charcoal and the impact of GCIC on their business. GCIC's incubation program focuses on nurturing green business and startups to make them better. Find out how GCIC helped John Afari-Idan CEO of Biogas Technologies Limited become a better entrepreneur. An interview with Ruka Sanusi, the Executive Director of the GCIC. As part of the Leadership for Engineering Class, students took on real world challenges. This group worked with students at the Akropong School of the Blind to build this solution. Fitted with sensors, the cane was designed to improve mobility for the visually impaired. For their class projects, freshmen in our Introduction to Engineering class teamed up in groups to design solar powered irrigation systems for farmers in rural Ghana. The students designed the system to detect when soil needed or had enough water, and power on or off automatically. Here's a quick video showing some of the finished projects. October 2015: Catch the video recap of our engineering launch ceremony. Highlighting musical performances, speeches, faculty interviews and a look inside the new engineering building, this video is not one to miss. A look at the work done to develop Ashesi's new Engineering program, and how a Fetzer Institute grant allowed faculty to deign values of love and compassion into our curriculum. Two weeks. That was exactly how long our first-year Engineering students had to design and build a working prototype for a solar-powered mini-generator to charge electronic devices. Ghanaian women’s right activist, Yawa Hansen-Quao shares keys that will help women and girls find their voice and rise up in leadership in the public sphere. Regina talks about how the one-sided stories painted about Africa could be changed using science and technology as a means of social transformation. The Emerging Leaders Initiative brings together the next generation of social entrepreneurs from around the world, selected and supported in partnership by the Skoll Foundation and Mastercard Foundation. Ashesi President Patrick Awuah speaks on The Ashesi Way: turning challenges into opportunities. A one-on-one chat with Patrick at the 2018 WISE summit in Accra. A conversation on future directions for higher education in Africa. The founder of a university college in Ghana and campaigner to raise the quality of higher education in Africa has won a major global education award. Patrick Awuah left Ghana in the 1980s to take up a scholarship in the US. On May 18, 2017 Ashesi held a panel in partnership with the International Finance Corporation (IFC) in Washington, D.C on Innovation in Sub-Saharan Africa Higher Education and Lessons from the U.S.
Live from the World Economic Forum's Solutions Summit with Patrick Awuah. Patrick, a Swarthmore University alumnus, delivered this year's McCabe Lecture "The Liberal Arts and the Future of Africa" at his alma mater. In his lecture, Patrick shares his thoughts about the challenges and opportunities Africa faces - and why he has come to believe more strongly than ever that a liberal education is fundamentally important to Africa's future. In April 2016, the Google re:Work team gathered leaders from across industries and across the globe to talk about the future of work. Founded in 2002, Ashesi aims to spark a renaissance in Africa by educating a new generation of ethical, entrepreneurial leaders. This video introduces Ashesi faculty, alumni and students who share what Ashesi means to them. Ashesi President Patrick Awuah is an education entrepreneur creating a new model for higher education in Africa that combines training in ethical leadership, a liberal arts tradition, and skills for contemporary African needs and opportunities. Patrick Awuah speaks with the Authenticity Project, about his leadership journey and hopes for Ashesi. Patrick speaks at the 2014 WISE conference. Patrick's famous 2007 TED Talk, in which he makes the case that a liberal arts education is critical to forming true leaders. Patrick returns to his alma mater as a guest speaker for the Dean's Speakers Series. Patrick shares his hope that Ashesi will help spark a renaissance in Africa. Patrick shares how fostering innovation is the key to creating lasting change in Africa. See for yourself the far-reaching impact that Ashesi students, staff, and faculty are generating. In these three videos, you’ll go behind-the-scenes to hear from project leaders and beneficiaries. Nicholas, Ashesi Lab Manager, started the optional Monday lab sessions, nicknamed the Makers Skills’ Lab to introduce students to practical engineering skills. Open to all students, the sessions are informal and hands-on, and students get to work on a range of projects from 3D-modeling and printing, to building electrical circuits. While their work plays a vital role in helping to protect the environment, mechanisms have not been developed to adequately compensate waste pickers, who are really ‘informal recyclers’, for the services they provide. Earning an average of $40 per month, most of these waste pickers are unable to make ends meet. To address this gap, a team of students from the MIT D-Lab and Ashesi’s D:Lab are working to create tools that will not only increase the earnings of the waste pickers, but will also give them access to financial platforms to help grow their income. As a pioneer in blending the liberal arts and sciences in Africa, Ashesi is recognized across the world as a model for higher education on the continent. With a vision of African universities leading the continent's renaissance, we are reaching out to colleagues and partners in higher education to build an idea-sharing platform; one where university leaders and stakeholders can collaborate to harness best practices in teaching, management, and administration. Our inaugural Education Collaborative in 2017 brought together 12 institutions from across Africa and the US to share ideas on advancing Higher Education in Africa.